Is there a “right” way to sleep? 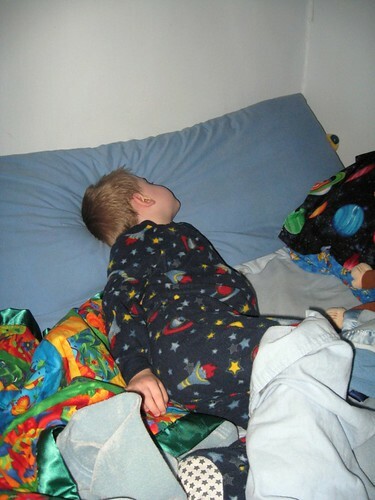 If there is a "right" way to sleep my 4 year old seriously does not understand it. Exhibit A – The way I found NHL yesterday night when I went in to check on the boys. Please note that the blue body pillow (MINE – which he now believes to be his) is on the wall the long way. 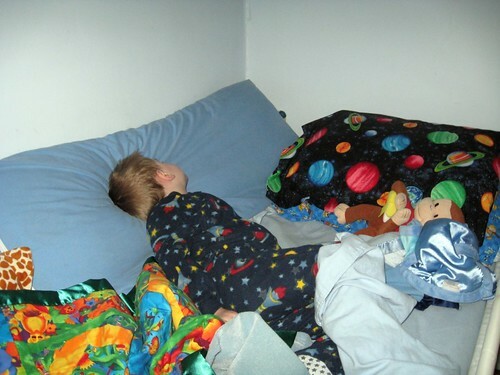 The planet pillow is actually at the top of his bed where he SHOULD be sleeping. Exhibit B – NHL all twisted up. A closer view of how he has his body positioned on the bed. Also notice why we MUST put him in a PJ sleeper since blankets do not stay on the child. Exhibit C – Even Curious George is not curious enough to sleep like his friend NHL and is at the correct part of the bed. OK – sure he is not on the pillow right, but at least he is closer to the so called "normal" way of doing things. Tonight he was sleeping on the side bar of the bed. Thank goodness that was there. Hopefully he will not fall out of bed at Bubbe and Grandpa’s house the next few nights. Sweet dreams! I am off to pack and sleep. We are off to visit JL’s parents tomorrow and have a long trip ahead. I shall try to post from there, but no promises. « Bite me . . . really hard! Can you take the guard-rail with you? P.S. If you can’t, what about a mattress on the floor.. so if he does fall out, he doesn’t have far to fall. Kmelion: We can take the guard-rail with us, but it will not work. We hauled it with us once before and it is useless with their new futon bed. . . nothing to anchor it between. We are going to take a body pillow with us and put that along the side that has air and drop zone. Hopefully it being a larger size may help him to stay in the bed. On that note I best be off to finish packing, load up the car and moo the baby before we jet. 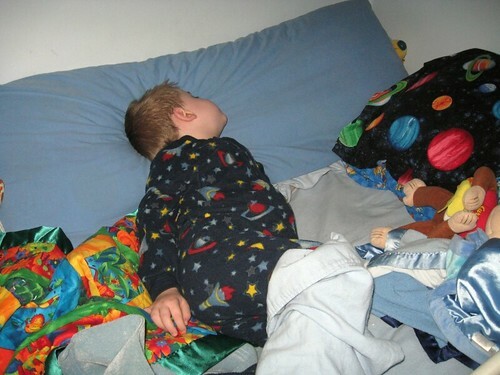 Isn’t it amazing how kids can sleep in any position? I need to be in the perfect temperature, the blanks just so, and no noise whatsoever! LOL! lol, looks about the way my guys sleep. Kailani: It really is amazing how kids will sleep no matter what the situation or noise level around them. Ah, to be like that again and not need specific pillows and things. Thanks and I will be posting about the trip soon. . . teething monster permitting.